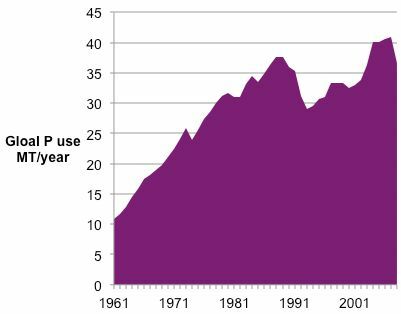 Global P consumption in Millions of Tonnes. Data from FAO. Phosphorus is essential for sustaining humanity, because it is essential nutrient for producing food, and it is often a limiting nutrient for plant growth. Unlike nitrogen, it cannot be fixed from the air, and must be either recycled or mined. Modern industrial agriculture relies on continual inputs of mined phosphor. How long phosphorus mining can last is quite uncertain. A new assessment of phosphor supplies suggests these are supplies are much bigger than previously thought. Reserves of the phosphate rock used to make such fertilizers are finite, and concerns have been raised that they are in danger of exhaustion. It has been argued, for example, that data from the US Geological Survey point to the available supplies peaking in as little as 25 years time (see Nature 461, 716–718; 2009). Because there is no substitute for phosphate in agriculture, this might present an urgent and substantial problem. 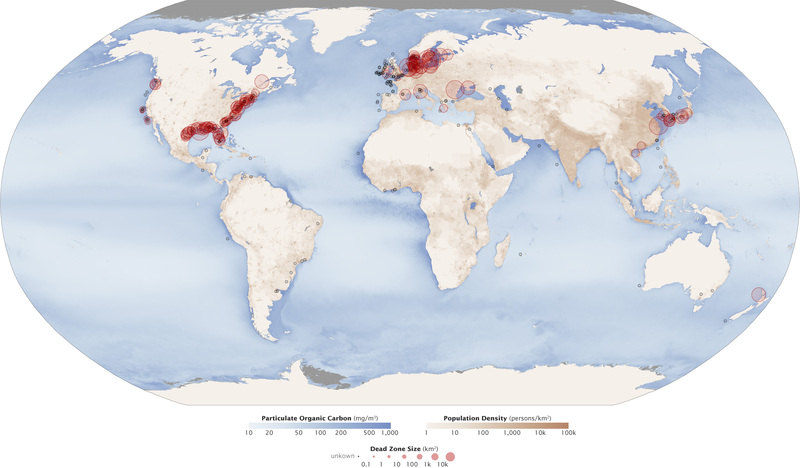 But initial findings from the World Phosphate Rock Reserves and Resources study conducted this year by the IFDC, an international non-profit organization based in Muscle Shoals, Alabama, and formerly known as the International Fertilizer Development Center, suggest that phosphate rock deposits should last for between 300 and 400 years. Accurate information about phosphate reserves is hard to come by, and the IFDC concedes that more work is needed to hone its estimates. The mining industry, governments and interested researchers should accept the organization’s invitation to collaborate in this process. The phosphate issue runs beyond gaining assurances that total global supply will meet demand. There remain important concerns that phosphate and other fertilizers are being squandered in some parts of the world, whereas farmers in other regions cannot obtain them at a reasonable cost. … current fertilizer-production methods fail to maximize the efficient conversion of phosphate rock into fertilizer. The supply of the rock is heavily concentrated in two nations, China and Morocco, on whose good faith the rest of the world relies for its phosphate supplies. That faith has been shaken by extreme price fluctuations in recent years. Yet the heavy dependence of food production on fertilizers, inequalities of supply and the need for sustainable use of fertilizers — including recycling — are largely missing from discussions on approaches to sustainable development. They were only mentioned in passing, for example, at the United Nations’ world summit on food security in Rome last November. Hydrologists, soil researchers and food scientists have begun to raise awareness of some of the issues surrounding phosphates. A discussion will be devoted to the topic at the Crop World 2010 meeting in London next week, in which researchers will be joined by industry and government representatives, including John Beddington, the UK government’s chief scientific adviser, who has worked hard to raise political awareness of food-security issues. These efforts would be strengthened if an international body, such as the UN Food and Agriculture Organization, started to seriously champion the issue of sustainable fertilizer use. The organization already tracks fertilizer demand and supply, and has produced reports on phosphate fertilizer use. It doesn’t have a specific programme for sustainable fertilizers, but its departments of agriculture and natural resources do some work in this area, giving it a base on which to build. It now needs to push this issue out from the sidelines and into the policy-making process that will shape the future of agriculture and sustainable development. The statement in the IFDC report that we have 300-400 years prior to depletion og phosphorus is based on a zero increase in extraction from now on. The rate of annual increase is presently in fact 3-4%. Extraction will hopefully decrease as we become more efficient, start significant reuse programmes, etc. But this will take decades and no UN governance or monitoring plan is in sight. The food security summits in 2008 and 2009 never mention the word phosphorus. The new data on increased reserves from IFDC are based almost entirely on a recalculation for Morocco giving them 10 times more phosphorus and 85% of the global capacity. But the estimates are based on a hypothetical calculation and economic viability does not figure in the calculation. There are no data on reserves from industry in the calculation since this is kept confidential. While this seems like welcome news, as Dr Rosemarin notes, the new estimate is entirely based on a revision of estimates for Morocco and seems to be derived from a 20-year old geological report and not on any new geological survey data. It is also important to note that the 300-400 year IFDC estimate for P depletion is a different event than the timing of “peak phosphorus”, which refers to the date when global P production will occur (previous estimates placed this timing for 2030-2040). It is likely that, even if this new reserve number for Morocco is correct and the P ore there is indeed of high quality and accessible, a production peak for P is likely only pushed back by a few decades. In any case, the key issue for any such commodity is PRICE and what remains to be analyzed is the likely future dynamics of P fertilizer prices in the face of the need to double food production by 2050 while simultaneously satisfying the burgeoning bioenergy industry. “Not quite assured”, indeed. Is this any way to run a biogeochemical cycle?